Etiology: Streptococcus equi subsp. 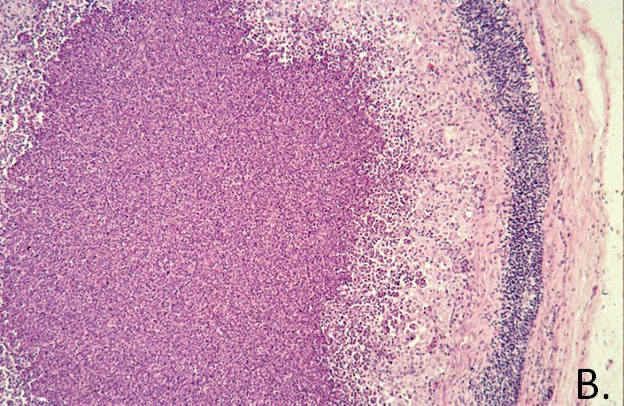 zooepidemicus is a Gram-positive, beta-hemolytic coccus that is commonly carried in the nasopharynx of guinea pigs. Streptobacillus moniliformis is rarely implicated. 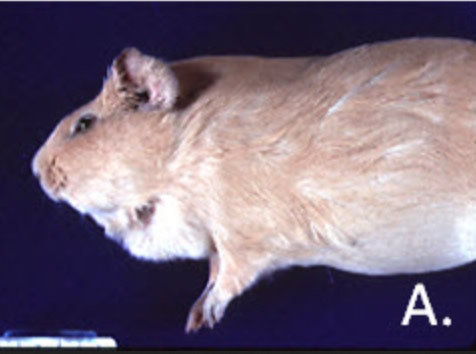 Incidence: Infection is rare in laboratory guinea pigs. Transmission: Bite wounds or direct contact with oral secretions are the major modes of transmission. Clinical Signs: The bacterium gains access to the mucosal surfaces through abrasions in the oral cavity. Localized infection of the cervical lymph nodes occurs and they become enlarged (A.) and develop abscesses. Otitis media and retrobulbar abscesses may also occur. Abscesses may spontaneously rupture and heal with time. Affected animals may show no other signs except nonspecific symptoms of pyrexia or anorexia immediately prior to rupture. Septicemia may develop and result in suppuration in multiple viscera. Pathology: Enlarged lymph nodes progressing to development of well encapsulated abscesses (B.) filled with a thick, yellow to white purulent exudate is characteristic of this infection. Numerous suppurative processes may be seen in multiple organ systems and may include bronchopneumonia, pleuritis and pericarditis. 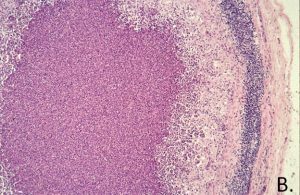 Diagnosis: Diagnosis is based on clinical presentation and culture of the organism from lesions.